The Advances in Cancer Research series provides invaluable information on the exciting and fast-moving field of cancer research. 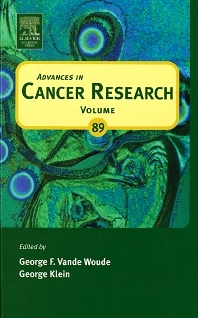 This volume presents outstanding and original reviews on a variety of topics, including Mdm2 - a regulator of cell growth and death; the systematic progression of human cancer; seizing of T-cells by human T-cell leukemia/lymphoma virus type II; host cell dependent expression of latent Epstein-Barr virus genomes; and gene expression profiling of renal cell carcinoma and its implications in diagnosis prognosis and therapeutics. Provides invaluable information on the exciting and fast-moving field of cancer research. Researchers and students in the basic and clinical science of cancer biology and oncology, as well as the related areas of genetics, immunology, pharmacology, cell biology, and molecular biology.